I know it’s still cold in some parts of the country and this three bean turkey chili is a perfect homemade comfort food that is definitely perfect for a family dinner on those cold nights. 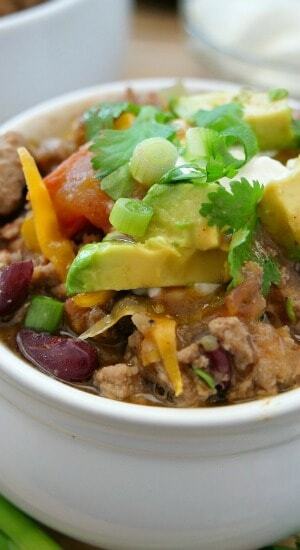 Loaded with all sorts of goodness, this turkey chili is super easy to make and makes a great dinnertime meal the whole family will enjoy. 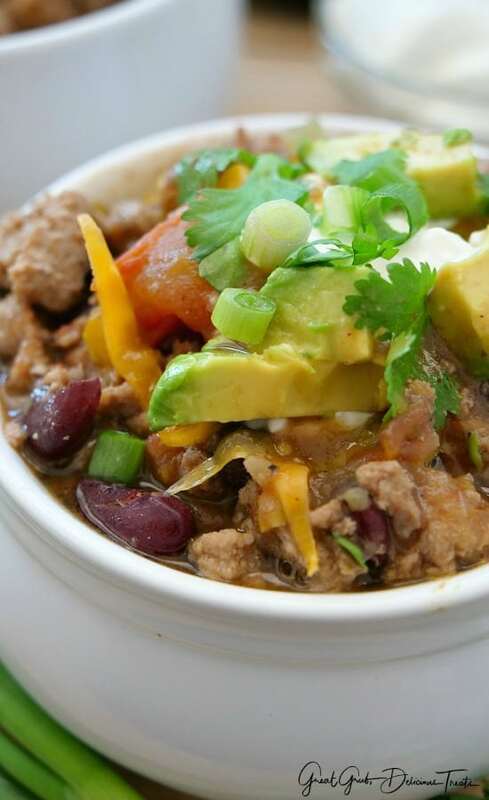 Also, this three bean turkey chili is a lot healthier for you too than the standard chili we are used to. 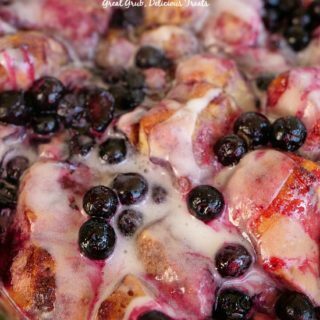 I love that the great taste isn’t lost when eating a healthy meal. 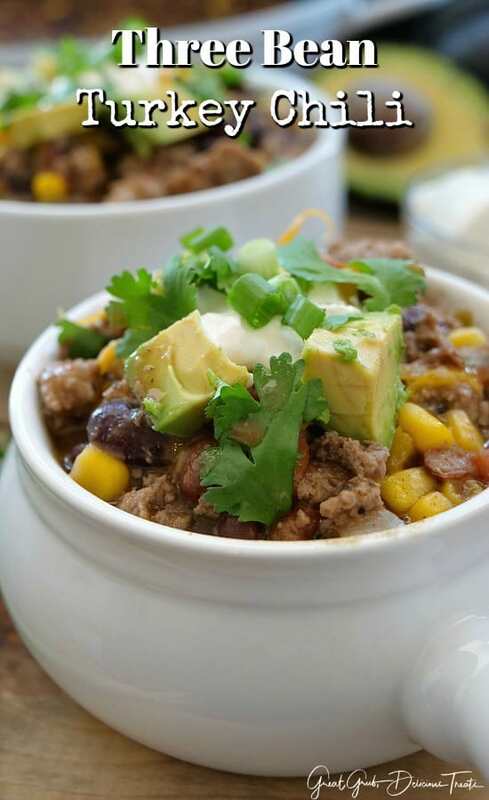 With all the seasonings and flavors added to this chili, it sure is a delicious, comforting meal that will have you coming back for seconds and thirds. We had this chili for about 3 straight days it was so good. Even for breakfast this was delicious and so satisfying. 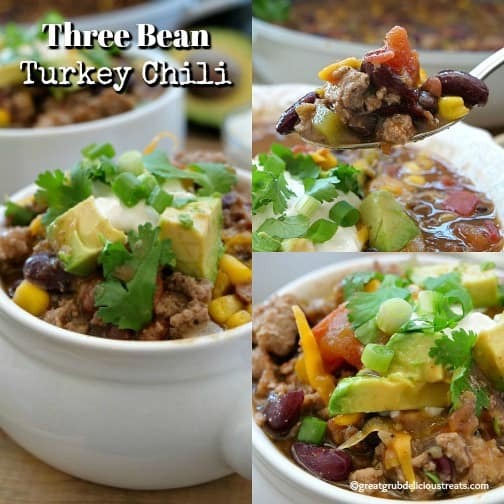 Using all the different colored bell peppers enhances the flavor of this delicious three bean turkey chili and it also adds so much color to the recipe. 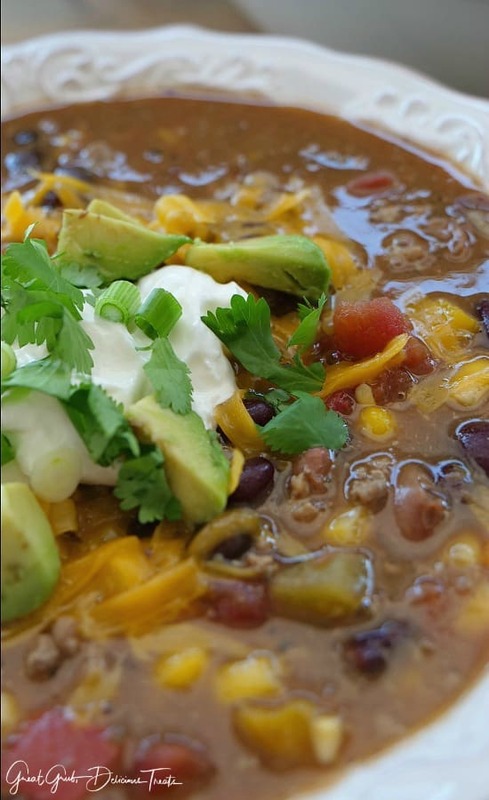 There’s nothing better than a big bowl of homemade chili and especially when it’s healthier for you. 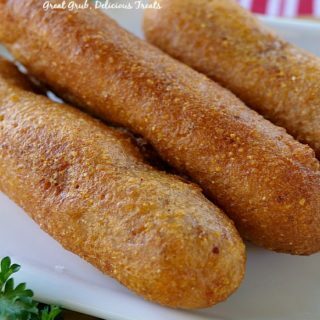 A perfect comfort food. 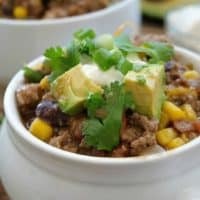 My friend, Lori over at sweetordeal.com made a turkey chili a couple of weeks ago (which this recipe was adapted from) and is just starting her own food blog. So when you get a chance, head on over to see how she’s doing with her blog. 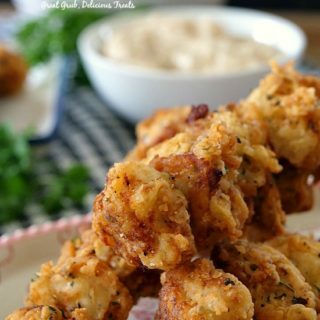 Like I said, Lori is just starting out so make sure to sign up for her email subscriptions so you can see when she posts a new recipe. 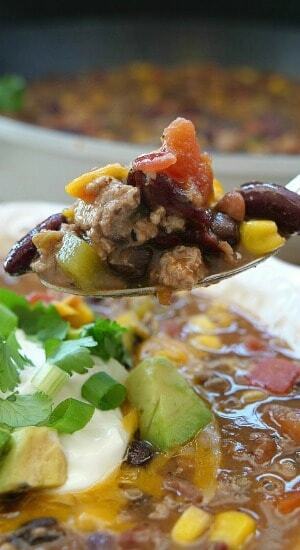 Using a crock pot to make this three bean turkey chili recipe would be another option that works well too. Sauté onions, garlic and bell peppers first then add the ground turkey and cook until it’s thoroughly cooked. Next, spray the crock pot with a non stick spray and place all the ingredients into the crock pot, starting with the turkey mixture. Stir and then cover and set the temperature to high or low, depending on your schedule. Cook 5-6 hours on high or 8 hours on low. And then add the corn in the last hour of cooking. 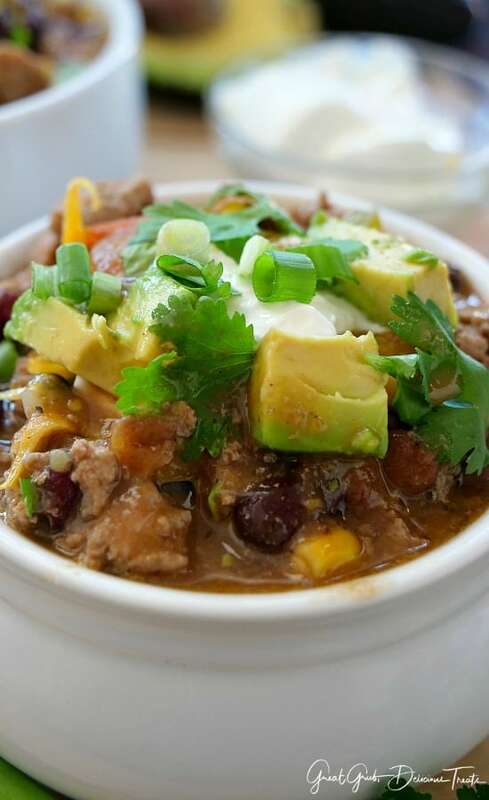 Make sure to top this tasty chili with some sour cream, sliced green onions, cilantro, avocados and of course cheese… lots of gooey cheese. How about some delicious Chuck Roast Spicy Chili, Crock Pot Spicy Charro Beans, Crock Pot Multi Bean Soup, Crock Pot Spicy Vegan Chili, and Crock Pot Beans and Ham. 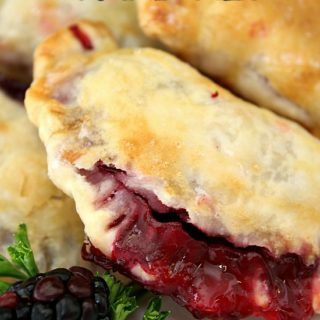 A delicious comfort food that the whole family will enjoy that's loaded with healthy goodness. Heat oil in a large stockpot over medium heat and sauté onions, garlic and bell peppers for 4-5 minutes. 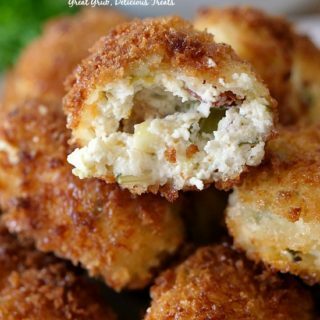 Add ground turkey and cook until turkey is no longer pink and is thoroughly cooked. If using extra lean, no need to drain. Sprinkle cumin, chili powder, oregano, cayenne pepper, red crushed peppers, salt and pepper over turkey mixture, stir. Add all three different beans, diced tomatoes, Rotel, diced green chillies, vegetable broth, stir. Bring to a boil, cover and reduce heat. 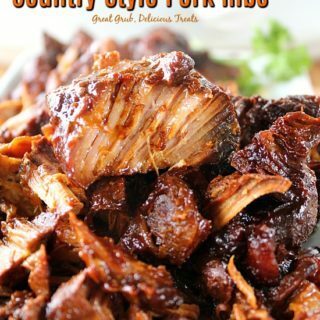 Simmer for 45-60 minutes.